Shift your Sculpt object in the Z direction, for creating stairs. At the moment, SL looks to a sculpted prim like a cube. (Instead of the sculpted 3D shape). 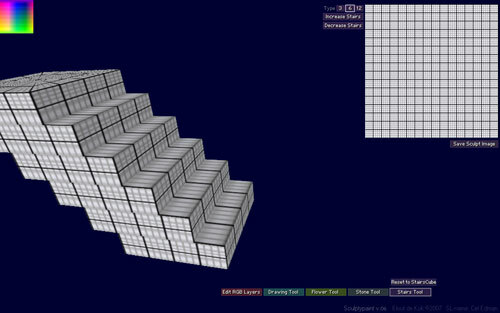 So to create working sculpted stairs. You have to put the Sculpt to phantom, Then scale, rotate and flatten a 3D box and put this just beneath the stairs into your sculpt object. I set it to maximum tranparant and give it a black color and no texture. Or you just could use a 100% transparant Texture. 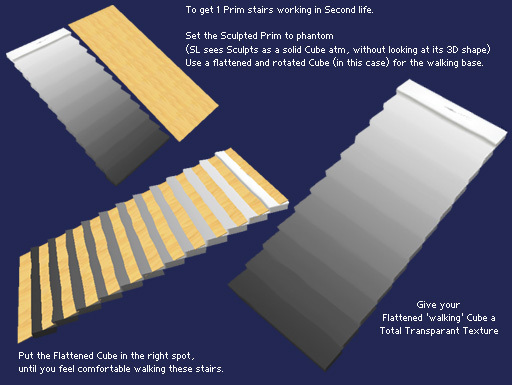 This way you can create a 2-prim working stairs. You can add a picture or a logo, to the stairs Texture for some strange results. (Since it's just 1 object). Some nice dark to light fade etc.